If you need to add user input without using a button, then a capacitive touch interface might be the answer. 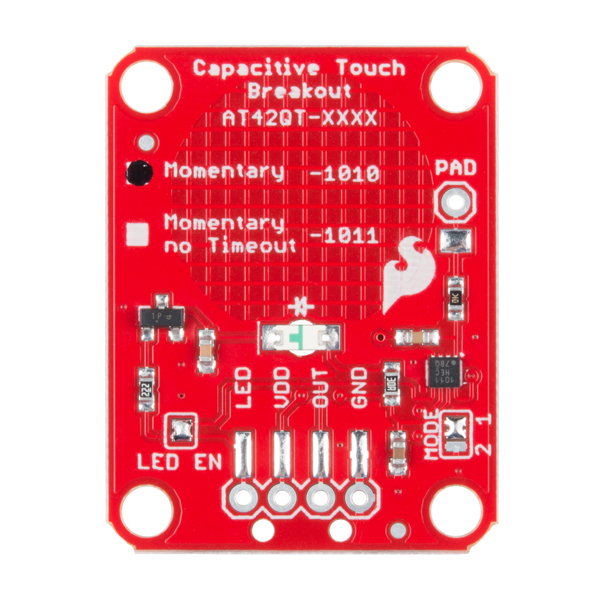 The AT42QT1010 SparkFun Capacitive Touch Breakout offers a single, momentary capacitive touch button with easy-to-use digital I/O pins. The AT42QT1010 is a dedicated, single-button capacitive sense chip. The chip handles monitoring a conductive area for touch. As long as a touch (e.g., from a finger) is detected, the AT42QT1010 keeps the output line high. Otherwise, the line is kept low. You just need to provide a power source (1.8V--5V) and ground for the AT42QT1010 to work. Additionally, a PAD pin is available if you would like to create your own external electrode. The product page for the AT42QT1010 breakout board did not change even though the IC package changed from the 6-Pin SOT23-6 to the 8-pin UDFN/USON. Functionally, it should be the same. If you are looking for the older tutorial for the AT42QT1010, check below. Is anyone aware of a component like this that provides an analog signal vs. just a digital signal this chip/board outputs? I'm interested in creating an array of 3+ sensors connected to a metallic structure that would be able to gauge rough position on that metallic structure based on 3+ analog readings of capacitance. Any ideas here? Would something like a trackpad work? Here's one designed for Arduino and other microcontrollers. The external pad is so sensitive. As soon as I attach a wire to the solder it triggers even if I am not touching the wire. Even in low power mode. Whops. forget it. Its fine if its soldered on. Do you know if this will sense a capacitive load through a very small surface area (e.g. tip of a 20AWG wire)? 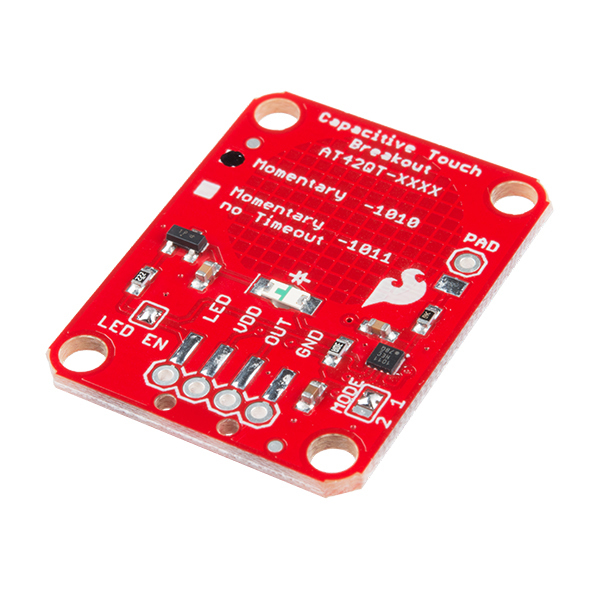 If so, would the large pad on this PCB diminish the sensitivity in such a use case, perhaps requiring the large pad to be disconnected by cutting the trace? I just tested this with a jumper wire, and yes, it does detect a touch through the tip of a wire connected to the PAD through hole. Note that because of the reduced surface area on the tip of the wire, you'll need to use a bit more pressure with your finger to have it register the touch. I do not believe that the large pad affects the sensitivity (the AT42QT1010 self-calibrates whenever it first boots up), but if you're worried about accidental touches on it, you can cut the trace between the PAD hole and the large pad. Is there a version of this that doesn't require a true ground? In theory I'd like to stuff one inside an Altoids tin. Hmmm...you might be able to connect your body to the common "ground" in the circuit. For example, have the bottom of the Altoids tin be tied to ground so that when your hand touches it, you are touching "ground" of the circuit. That way, your body appears grounded (at least according to the circuit) when you go to push the cap touch button. How did you get the LED to be placed upside-down? Was it placed by hand or do you guys have a super duper pick-and-place? They come prepacked upside-down in the reel. The PnP machine is set up to look for the components leads so it doesn't notice the difference between a LED that is upside down or right side up. What board house are you planning to use? I've had pretty good luck with OSH Park. They're also really cheap, so you won't waste a bunch of money if you mess up. If you have a way to upload the files (something like github), I can take a quick look. I do use OSH Park and I love them and you are right they are cheap. I will get one pushed up to github and let you know. Thanks for the help. May be you guys a SparkFun can use it to build and sell it.. I have two questions about this board. First, is the criss-cross pattern in the ground plane just to provide a sense of where the touch pad is actually located? And secondly, is the "PAD" label in the eagle schematic just there to show that the pad is technically connected to JP5? It looks like deleting this label has no effect on the .brd file. Thanks! The criss-cross pattern was the recommended ground plane layout by the manufacturer. It cannot sense the precise location (the button can only give you a simple pushed or not-pushed state). You are correct about the PAD label. 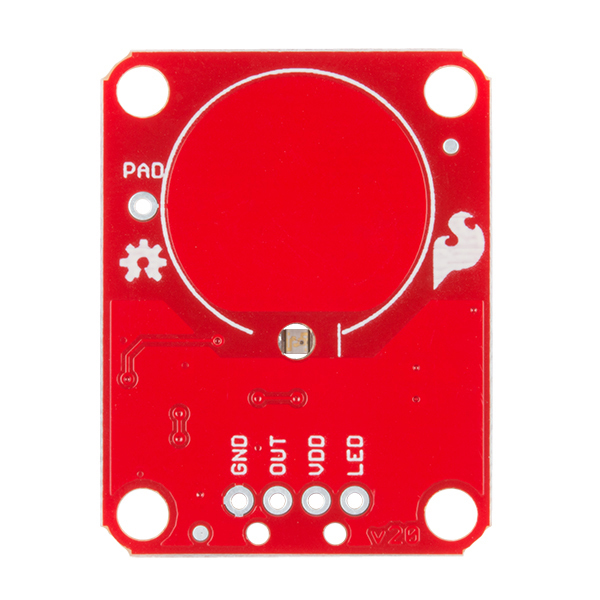 It is there to show users that they can connect a wire to either JP5 or the through hole and break out their own touch pad if they want. Deleting the label should have no effect on the board functionality. Greetings. I am just getting back into the electronics game after a few years off. So I am a bit rusty. I have a general i/o button board for a BrightSign audio player. Can I just connect these to the terminals and have them function or do I need to do something extra? Link below to my existing button board. How to feed the "out" of this 1010 chip to operate a 350 ma micro puck led driver? It will only source 20ma max from the out pin, is there a relay with that small of coil requirement? I guess I'll look at the data sheet for the max control voltage out of the "out"pin. I don't see any use of the capacitor cx on this board. Can I take this to mean that I can ignore cx? Thanks. The datasheet is not very clear about that. If you take a look at Atmel's Secrets of a Successful QTouch Design app note, you see that Cx does not appear anywhere (the electrode is just connected by a single line from the IC). Therefore, the best I can figure is that Cx is suppose to represent the capacitance from the electrode to ground through something like your finger. hello, can anyone please tell me the differences between AT42QT1010 (used here) and AT42QT1011 and AT42QT1012? they are all 1 channel digital output sensor. Seems like the -1011 has an "infinite max on duration" whereas the -1010 will cutoff after about 47 seconds of a touch event. The -1012 seems to have more configuration options than either the -1010 or the -1011 ("Power Management Functions"). The Product description says: "As long as a touch (e.g. from a finger) is detected, the AT42QT1010 keeps the output line high", which is what I need. Unfortunatly the chip resets to 0 after aprox. 47 seconds. This is also described in the datasheet of the AT42QT1010 at section '3.3. Max On-duration'. Maybe you should add this infromation to the description. If you're handy with a soldering iron, you could swap the AT42QT1010 with an AT42QT1011, as that seems to have an "infinite max on duration" as per its datasheet. I'm trying to make a capacitive flood detector and I've run into a problem. I'm applying power to the sensor, waiting 100ms then reading the OUT pin; the process repeats every 5 minutes. Here is the issue I'm experiencing: if my finger (or anything else with high relative permittivity) is on the sensor pad before I power on the sensor, the OUT pin never changes to high; I've confirmed the behavior with my oscilloscope. If I power on the sensor, then touch the pad it works fine. Any idea what's going on? It looks like that is the intended behavior of the chip. I tried it and can confirm what you saw. It seems that the AT42QT1010 does some calibration when you initially apply power and cannot register a touch event if your finger is present on power up. You have to take your finger away for ~1 second before it can start registering touches again. Cool! I've been wanting to add touch inputs to replace the paddle on my ham radio Morse keyer (built around an Arduino) but I've been too lazy. Now I will. Time to spend money! And even cooler, if I read the datasheet correctly the chip can work by proximity as well as direct touch. So I can just wave my finger over it, maybe? Would you guys consider making a version that could select between momentary or toggle output modes please? I'd love to see this available, Thanks! In the meantime, you could use a flip-flop to turn the momentary output into a toggling one. With a CD4013B chip, tie the momentary touchpad output to the clock input of the flip-flop, and tie the !Q output back to the D input. Each time there is a rising edge on the clock input, the flip-flop output will change state - one pulse to turn it on, one pulse to turn it off. Duly noted - a toggle version would be very useful - thank you! Something we can certainly look into. The Hookup guide says that the external electrode can be almost any shape or size... well, is this to be taken literally. I am trying to turn some two foot sheet steel cubes into touch sensors. Possible with this? In theory, yes. I haven't tried something that large. If it works, please let us know! So... this product is amazing. Just hooked it up, did some test runs for its limits. So far, I've been able to detect my finger's presence through EIGHT MILLIMETERS of plastic. Oh, and did I mention that it's actually two separate pieces of 4mm thick plastic? Yeah. Phenomenal. I used this in a project to sense when someone grabs a metal handle and it worked great. The tech docs talk about using capacitors and things to adjust the sensitivity and I though that might be an issue with the big metal handle as the sensor but fortunately it wasn't! Just hooked up power, ground, the output signal, and the metal handle to the pad connection and it worked perfectly. This Atmel breakout has been terrific in prototyping single touch capability into my project. In general, breakouts that are 1) small and 2) adjustable are the most useful and Sparkfun has gotten the knack for them. For this particular breakout, it has a few key attributes that assist in prototyping. First it has a touchpad connection that easily allows the extension of the pad into your application. Second, it has a connection for the logic level output from the controller. So, in addition to the built-in visual indication, you can easily hook the logic output to something else. If you want to disconnect the LED, there is a solder jumper for that too (no severing lines permanently with an Xacto knife!). Anyway, you get the idea. These little boards are the reason Sparkfun is always the first stop when I am cobbling together an initial concept with bailing wire, duct tape and breakout boards! I've used a number of these in a museum exhibit and they've been working well for over a year now. I attached wires to them and then to copper boards but found they were way too sensitive, so I ended up coiling up the wires behind the copper boards and they act as antennas. It took a bit of work to get them just right, but they work perfect now. I'm using this a a touch sensor in a talking hat so the sensor is actually covered with fabric and it still works every time. I would buy it again. Very good and reliable circuit. 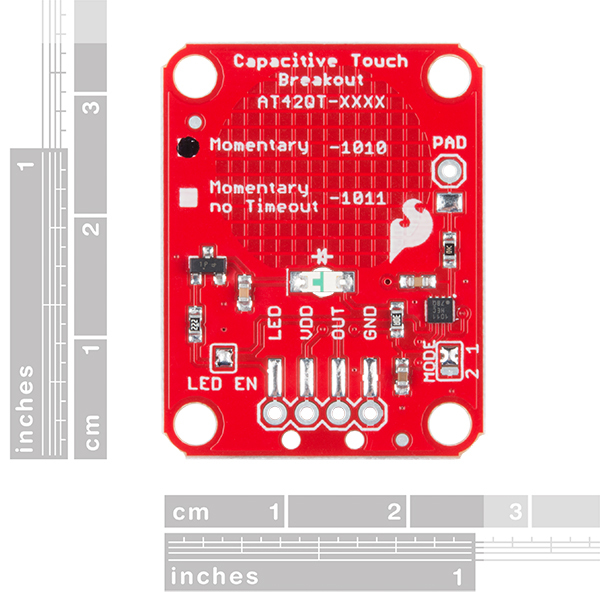 The sparkfun product again is properly designed, well thought true. However, the AT42QT1010 simply is not reliable. Lots of false detects. I've used 4 of these. Used 1 with a 5 volt power, and a transistor to a timer and it often needs reset and has been overly sensitive to outside static due to dry conditions in Montana. I've made this set up 3 times & have shortened the copper tape to a foot & still the touch sensor starts malfunctioning. I really like these when they are working right though.